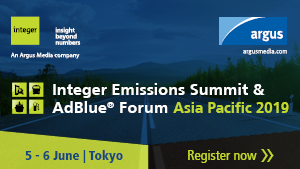 Following the success of 2018, Integer Emissions Summit & AdBlue® Forum Asia Pacific will return to Tokyo in 2019. Bringing together key thought leaders, this conference will provide a unique opportunity to discuss the latest developments, legislation, and technology shaping the Asia Pacific and global emissions control industry. With well over a decade’s experience, Integer Research is a leading independent global conference provider for the emissions control and AUS 32 industries. Our conferences and forums are attended by senior executives and key decision makers from governments, OEMs, associations, equipment suppliers and the AUS 32 markets globally. This year the Integer Emissions Summit series will visit Japan, North America, Belgium, China, India, Russia, Mexico and Brazil.